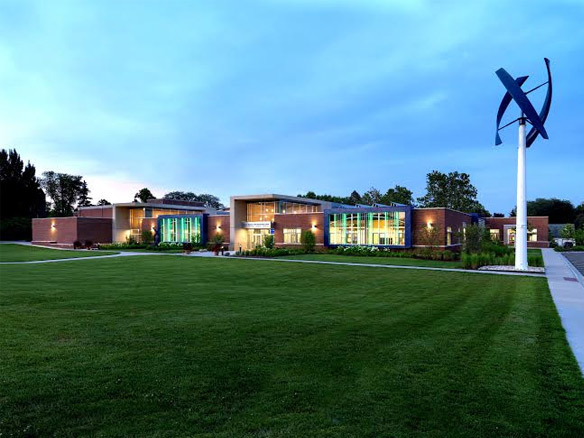 The U.S. Green Building Council had awarded the John C. Dunham STEM Partnership School at Aurora University with a Leadership in Energy and Environmental Design (LEED) Platinum certification, recognizing the energy-efficient and high-performing design of the building. The STEM Partnership School is one of three schools in Illinois and one of only 43 schools in the USA and 47 schools worldwide to obtain LEED Platinum status. As a result of intense national interest in sustainable or "green" design, The US Green Building Council’s LEED Rating system for Schools establishes an internationally recognized third-party benchmark for design and construction quality, recognizing the unique nature of K- 12 school spaces and children’s health issues. It addresses issues such as classroom acoustics, master planning, mold prevention, and environmental site assessment. Most importantly, these design initiatives signify an enhanced learning environment. Aurora University’s Assistant Vice President of Administration Jeff Cali noted, "We can see the students’ enthusiasm as they learn and grow in this space." • Structure and function that serve as teaching tools, with a garden and greenhouse on the roof, solar panels, and a wind turbine. Interior features, including piping, plumbing and insulation, are exposed to allow students to learn how they work. • Exterior "light shelves" above the south windows of the school serve an important sustainability role for the building, reflecting light deeper into the building and reducing energy needed for artificial lighting. Similar structures inside the building maximize this effect. • State-of-the-art heating and air conditioning technology. Under normal operation, HVAC systems maintain set-points and indiscriminately introduce at least 20% outside air to meet codes. The HVAC system in the school introduces more outside air, as much as 100%, instead of recycling it, allowing for the CO2 levels to be reduced to optimum levels for human comfort. • Sensors in each room automatically control the lighting, heating, and cooling systems based on occupancy. This ensures that no resources are wasted by lighting or air conditioning a room that’s not in use. • Onsite renewable energy generation large enough that it at times exceeds the school’s demand. When this happens, the excess power is purchased by ComEd and is credited to the school. In essence, the meter "spins backwards." • Dedicated space inside the building that is accessible and available for shared use by the community. Under the leadership of the Institute for Collaboration of Aurora University, the Center has created an innovative model for mathematics and science education in a diverse urban community. This model can be replicated across the country. "A hands-on education in math and science is important for our community’s young citizens," says Aurora University President Dr. Sherrick. "It arms them with the tools they need to grow, achieve and succeed in life." The curriculum for students was developed through a unique collaboration between area educators and local corporations, covering the STEM fields as well as art, music and more. This team including four participating school districts, the university, and governmental, not-for-profit, and corporate partners such as Argonne National Laboratory, Fermilab, Caterpillar, Waste Management, Excelon Nicor Gas, and Tellabs-have worked cooperatively to plan facilities. The 32,000 square foot facility includes eight classrooms and six labs, and serves students in third through eighth grades. It is staffed through a professional development strategy that engages teachers from the partner districts as faculty while they complete AU graduate coursework and become leaders in mathematics and science education. The John C. Dunham STEM Partnership School is an innovative learning facility designed to address regional and national deficiencies in science, technology, engineering, and math education. In addition to igniting passion for mathematics and science in the community’s students, the facility serves as a center for teacher preparations, faculty development, and educational research. The fields of science, technology, mathematics, and engineering are important economic catalysts that move both industry and the service sector forward. Yet many of today’s students have not been achieving in STEM subject areas at the high levels necessary to compete for jobs in even the near future. Even as globalization makes these high-demand fields more important, the United States faces serious knowledge deficiencies in human capital surrounding these critical subjects. The innovative STEM Partnership School leverages the community as a laboratory to help create the workforce and leaders of tomorrow. Jeff Cali notes that the LEED Platinum certification "is a testament to the hard work and dedication of the many partners involved in planning and construction. We are all proud of the example this building sets for future school construction throughout the country." Sherry Eagle, executive director for the Institute for Collaboration at Aurora University, hopes the school’s curriculum, and even the school itself, will be copied across the state and even the nation. "That would be the biggest compliment," she said.